"The Domaine of Ghislaine and Jean-Hugues Goisot is in all reality a fine Chablis estate, but history has not been particularly kind to the region, as Saint Bris was removed from the Chablis appellation after phylloxera ripped through the area in the late nineteenth century. Prior to this, Saint Bris was part of Chablis, which seems quite logical, given that it shares the same base of profound Kimmeridgian limestone and the same northerly climate as its neighbor a few kilometers to the east. But now Saint Bris is officially a sub-region of the Côte d'Auxerre, which is only officially entitled to Bourgogne status. However, one of the nice side effects of the switch in official status is that the Goisots, like all of the other growers in Saint Bris, are allowed to plant other grapes beyond chardonnay, and in fact Saint Bris is quite well-known for its excellent sauvignon blancs made in these same deep, chalky soils. 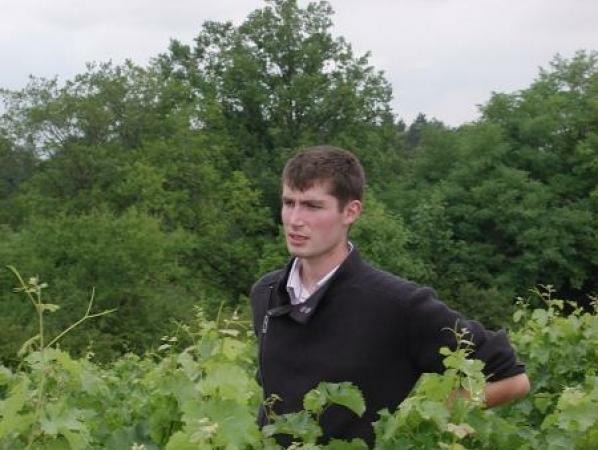 Guilhem and and father Jean-Hugues Goisot, like all top vignerons in France, recognize that great wine comes from great viticulture, and they work tirelessly in the vines to ensure that their parcels are as well treated as is possible. Their viticulture is certified biodynamic, with great pains taken to produce as natural an environment for the vines, with a goal of stimulating the natural defenses of the vines against disease and depredation. Yields are also kept very low by Saint Bris standards, in an effort to produce world class wines that defy the dictates of the late nineteenth century officials who downgraded Saint Bris and cast it from the Chablisienne constellation. The results are a bevy of beautifully made wines that have a very strong following in France and offer absolutely brilliant price-quality rapport. The wines across the board are deep, racy and soil-driven, with as transparent an expression of underlying chalky terroir as any in Chablis proper. The Goisots make two distinct bottlings of Bourgogne Blanc, one from aligoté and one from chardonnay, with the chardonnay bottling a dead-ringer for fine Chablis. The wines are fermented and raised in stainless steel tanks, and bottled carefully to retain as much of their purity and precision. The Bourgogne Blanc Chardonnay is one of the best values to be found in the world for soil-driven, complex and full-bodied chardonnay. As good as the chardonnay is, the sauvignon blanc bottlings that are labeled as Sauvignon de Saint Bris may even be better, as they share many attributes with top bottlings of Sancerre from terres blanches soils, and are generally cropped at lower yields than all but the very best estates in Sancerre. In top vintages the domaine makes a reserve bottling of their wines, which they call "Corps de Garde", which are made from the family's' finest parcels of old vines in their top vineyards. They are meant to age for a few years and are exemplary expressions of their underlying terroirs and varietal composition. The Goisots also make a small amount of the best pinot noir to be found in the Côte d'Auxerre, from the town of Irancy, which also happens to be the finest pinot noir made in the entire region of Chablis. Irancy pinots tend to be quite red fruity and smoky in character, with a lovely combination of pinot noir's tangy core of fruit coupled to the intense chalky soil tones found in the region. Stylistically they are quite similar to the best red wines made in the Côte Chalonnais towns of Mercurey, Rully and Givry, but with perhaps a more profound and unique expression of terroir from the deep chalky hills of the town. They make a superb example from their vineyard of Les Mazelots, which is a very old vine plot planted with ninety-seven year-old pinot noir vines. The Goisots only make two hundred cases a year of this rare and outstanding, medium-full, red Burgundy. All things considered, Ghislaine and Jean-Hugues are two extremely gifted and dedicated winemakers, who turn out superb expressions of their respective terroirs from one of the greatest value-producing appellations in all of France. If you have not yet dipped a toe in the water of Sauvignon de Saint Bris, Irancy rouge or the lovely Bourgogne Blancs to be had in the Côte d'Auxerre, you could do no better than starting at the top with the wines of Domaine Goisot." Wine Advocate 91 "The 2015 Saint-Bris Exogyra Virgula has a perfumed bouquet of white flower, broom, fennel and blackcurrant leaf. The palate is well balanced with a fine line of acidity, crisp and focused with superb tension, especially given the sappy, saline finish and intense citric aftertaste.